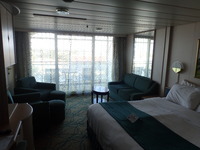 My wife and I recently cruised on the Rhapsody of the Seas, to date this has been the smallest cruise ship we have sailed on. I can honestly say I think it may be a new favourite! I enjoyed the smaller ship and not having thousands of people! For us cruising has always been about the ship firstly and where it is going secondly! Since this smaller ship was able to get into a few ports we had not been to previously like Belize and Roatan it was a great trip! We found that the ships crew was very helpful and the food was very good! We decided on this trip to try the Chef&apos;s Table and I must say it did not disappoint! The food was fantastic and the wine pairing was excellent. I learned a lot about picking wines, and as a person that does not drink much, it was very informative! We also took a Sushi making course in Izumi and that was fantastic! I cant wait to try those recipes and make some sushi at home! Smaller ships can be Grand! 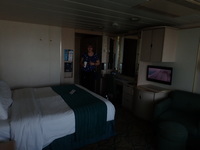 Cabin was very good, lots of storage places and was in good shape considering the age of the ship! Only thing that was a bit troublesome was the balcony door rattled at night. But nothing that a bit of folded up paper could not fix. Our room attendant was great! Some of the best snorkeling I have done! The Reef in Belize is alive and amazing array of sea life! Bicycling and clear bottom Kayak was OK, but the kayaking was a bit of a disappointment. They took us just off shore and showed us a few fish was honestly expecting more than 30 minutes of kayaking.